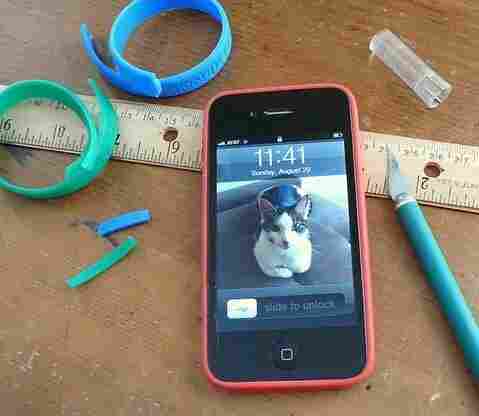 DIY: Make Your Own iPhone Bumper : All Tech Considered Apple makes you wait two-to-four weeks for an iPhone 4 bumper. But with a little patience, you can get crafty and make one out of one of those yellow Live Strong bracelets. The plainer the band, the better. Incised text and graphics seem to decrease strength and definitely limit your cutting options. Make cuts smaller than you think you need. Bracelet elasticity varies. You can always make an opening bigger later. Stretch the bracelet on the phone from the top down. If you don’t start with the most intact part of the band, you slingshot your device across the room or the bracelet tends to snap. Get backup bracelets. You might be lucky and get it right on the first try, but it’s a hack, not a bomb-proof solution. I finally caved and ordered an iPhone 4. I couldn’t get one of the free cases or bumpers to correct that wee antenna issue until after I got my phone, though; I have to enter the phone’s serial number into the app that allows me to order one. After I do this, it takes two to four weeks for the case to arrive. In that time, I will undoubtedly drop, kick, drop-kick, or otherwise maim said iPhone. But, I want that freebie case. So when I discovered a hack that let me turn those yellow LiveStrong bracelets into an iPhone 4 bumper, I was delighted. The hack would get me through the weeks it takes to get the boring-but-free bumper. It solves the antenna issue. It allows me to keep a decent grip on its slippery metal and glass body. It’s cheap. It might provide a little protection when I put it on a table. It could even include an element of recycling. One problem: I had a smorgasbord of Xacto knives, self-healing cutting mats, even a Dremel tool – but no silicone bracelet. And I must not be hanging out at the places where they sell/give away those things because I couldn’t find one except online. That, or Silly Bandz have officially taken over the world. I sent an e-mail to coworkers in the name of DIY and got three different bracelet specimens and a bonanza of interested responses ranging from supportively disgruntled (“Apple is SO LAME for not sending along a case. Grrrr…”) to alternative suggestions (scotch tape, big rubber bands, leaving it wrapped up until I can order my custom case) to entrepreneurial pitches (‘Maybe someone should set up a "RECEPTION STRONG" iPhone bracelet business’). One of the three bracelets made it through the cutting and stretching process and is currently squishing the bejeebers out of that stainless steel antenna. But it works and, strangely, looks like it was made to go with the phone. There’s a nanometer of overhang that keeps the back and face from directly touching a flat surface, but I’ve already determined that I have to do more to protect it from my clumsiness. And I swear, you really can do this yourself. Anyone who knows me, knows I'm a hands-on, self-reliant person. I've got a green thumb and the community garden plot to prove it. I've helped roof a house more than once. I've made several ballgowns, one in less than five hours. However, it's becoming more difficult to fix your own technical problems without an engineering degree and an electrician's license and there's something very satisfying about the simple solution of this hack. All you need is a couple bracelets, a steady hand and some patience. Next hack: the hollowed-out Moleskin notebook.